Snails are strange-looking creatures with shells and large stalks sticking out of the tops of their heads. Because most snails are small, it can be difficult to see their primary features. However, snails do have eyes and vision, though the exact location of the eyes and their use depends on the specific type of snail. Snails don't rely on sight as much as humans, but it's still one of their senses. Land snails have two pairs of tentacles. The snail can move these tentacles, which stick out from the top of the snail's head, to get a better idea of its surroundings. The two tallest tentacles have eyes at their tips. Land snails have a wider frame of vision because they're able to move their eyes around using their tentacles. Sea snails also have eyes, but in an entirely different place. Rather than sitting at the tips of the snails tentacles, a sea snails eyes are situated at the base. Sea snails cannot move their eyes around in the way a land snail can -- instead, they're locked in place much in the way a human's eyes are locked in position at the center of the face. Some snails have no eyes or are otherwise incapable of seeing. Certain species of underground snails never develop eyes and instead use their tentacles to find their way around, while others actually develop eyes that never see. Snails without vision are not limited in their ability to move, however, and can easily navigate their habitats through their sense of touch and smell. 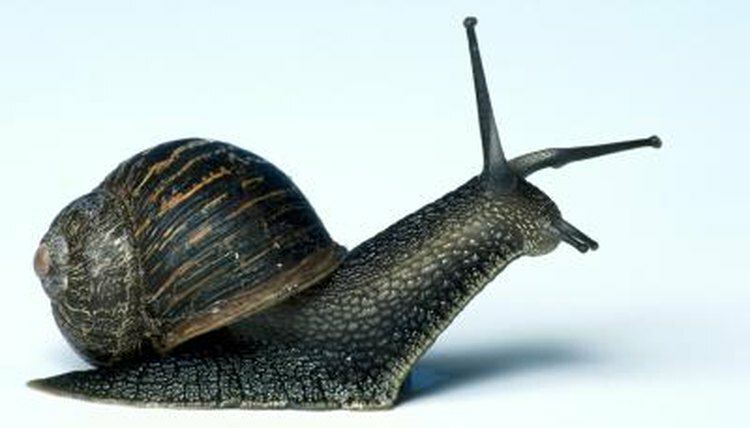 The quality of a snail's vision depends on the individual snail and its primary diet. Some snails, for example, can only see differences between light and dark, while others can clearly make out prey and other targets. Every snail species is different, but carnivorous snails generally have better vision than herbivorous snails because they need that vision to hunt. Snails also have different eye types – some have eyes that work like pinhole cameras while others have vesicular eyes with functionality more closely matching the eyes of a human.